Our office was looking to add a senior engineer and our engineering manager thought he had found the perfect candidate. His resume was impressive, with just the kind of experience and skills we were looking for. He interviewed with a few of our top engineers before sitting down with me, the operations manager and ultimate decision maker. Soon after the candidate left, my colleagues who had talked with him approached me and shared their excitement about the prospect of making the hire. "He has a great resume," one said, "it will really strengthen our group." The others nodded in agreement. "But we're not hiring a resume," I countered, "we're hiring a person. Did anyone happen to notice that he seems to be kind of a jerk?" They grudgingly had to agree. We decided to pass, even though that resume would have looked good in our proposals. Hiring the resume rather than the person seems to be a common mistake, particularly in technical fields such as the A/E profession. We reinforce the error when we spend most of the interview asking questions about skills and experience. Not that those credentials aren't important; they're just not the most important factor in making great hires. Personal character is. Skills can be trained and experience gained, but personal character is very difficult to change. If you believe that values such as integrity, service, commitment, initiative, and teamwork are important to your business, why would you hire people who don't possess these traits? Of course, no one purposefully ignores personal character when hiring, but most firms don't explicitly incorporate it in their hiring process. Determine what personal character traits are most important. At one level, these should reflect your company's core values and culture. If integrity and client focus are firm values, for example, you need to hire people who have the same values. Would you really want the world's best engineer or architect if that person lacked integrity or didn't care about clients? I didn't think so. But do you ask the right questions to uncover whether candidates specifically match your firm's values and culture? The character traits you're looking for will also relate in part to the position being filled. Taking initiative, to suggest one characteristic, will obviously be less critical for an entry-level employee than someone in a management role. In any case, the recommendation is to spend some time determining what personal character traits you want, both in general terms for all new hires and for each particular opening. Ask about past experiences that required a principled response. Ask questions such as: "Have you ever had a client ask you to meet a deadline that you knew your firm probably couldn't meet? What did you do?" The downside of such questions is that the candidate may not have had that particular experience you are asking about or can't remember it. Therefore, it's best to ask about relatively common situations (as in the example question). Create a scenario and ask the candidate how he or she would respond. If you're looking for how the candidate would deal with something less common, the best approach is to use a theoretical situation: "Imagine that your boss promised the client to meet a schedule that you know is impossible. What would you do?" Behavior- or values-based questions like these are far more useful in assessing the person than the usual resume-oriented inquiries such as: "Can you tell me about your experience working with railroad fueling facilities?" Again, resume questions have their place in the interview, but shouldn't crowd out critical questions about what kind of person it is that you're considering hiring. Pay attention to body language. Obviously, the verbal responses you receive to your questions are only part of the answer. I don't claim to have expertise in reading body language (and you probably don't either), but there are a few things that most of us can detect that at least raise alarms. Watch facial expressions: Does the candidate seem eager to answer your question or is there a hint of annoyance or dismissiveness? Notice the eyes: Does he or she look away when answering (suggesting a less than honest reply)? It can be helpful to have a couple of people present for the interview, one asking most of the questions and the other focusing on both the verbal and nonverbal responses. 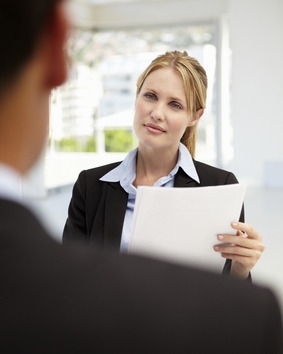 Formalize your interview process. In most A/E firms, there is more attention given to what questions not to ask than which to ask. The structure of the interview is typically left up to individual hiring managers. That may work with a traditional qualifications-based approach, but won't succeed if you want to start hiring for certain personal characteristics and values. I recommend developing a standard interview checklist or questionnaire that can be readily modified for position- or department-specific needs. Provide training both in how to use this in a new values-based approach and how to generally conduct more effective interviews. As business picks up and you're hiring again, focusing on people versus just resumes will help you build a sustainable competitive advantage.